There is something about velvet that makes it the perfect fabric to step out in the moment the holiday season kicks off. It is elegant, festive and also timeless, plus we love the many ways we can wear it. From bags and shoes to stunning going out dresses, there is a design for every category in our closets. Shop With Us: No Cold Weather Wardrobe Is Complete Without a Poncho — and This One Is on Sale! So many covetable velvet designs are available at Nordstrom right now — just in time for the holiday parties we have marked on our calendars. Check out all the fabulous finds that we are dropping into our shopping carts ASAP. Ready to Shop With Us? Bombshell holiday dressing, here we come! 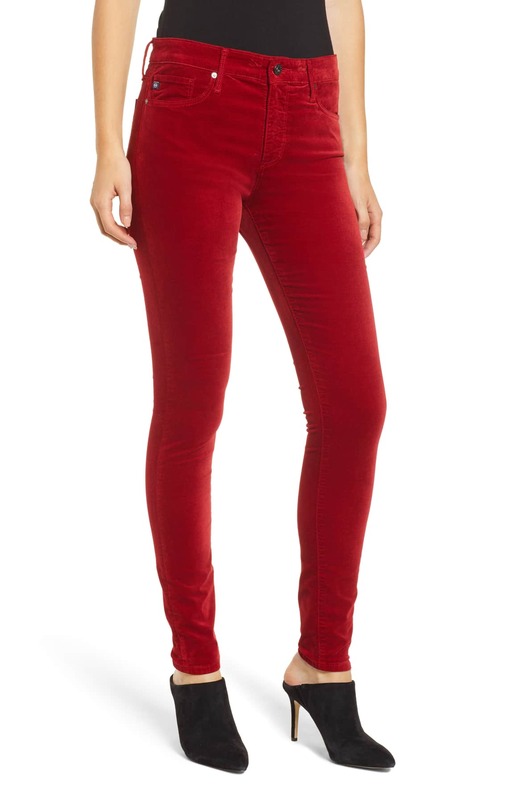 These AG The Farrah High Waist Velvet Jeans are totally worth scooping up for our closets! They have a zip fly with a button closure, five pockets for storage if needed and are made of a stretchy fabric blend meant to hug our curves in the sweetest way. The jeans come in four color options, including red (above), cognac, black and blue. Sizes range from 23 to 32 and are available based on color. Shoppers who grabbed this design love the fit and the soft fabric. See it: Grab these designer AG The Farrah High Waist Velvet Jeans for $198. This Madewell Velvet Butterfly Top has a stunning simple design with feminine, fluttery sleeves. It’s available in six colors, including pink, green (above), navy blue, red, dark metal (grey) and gold. The top comes in regular and plus sizes. Regular sizes range from XXS to XXL. Plus sizes include 2X and 3X. See it: Snag the Madewell Velvet Butterfly Top for $45. 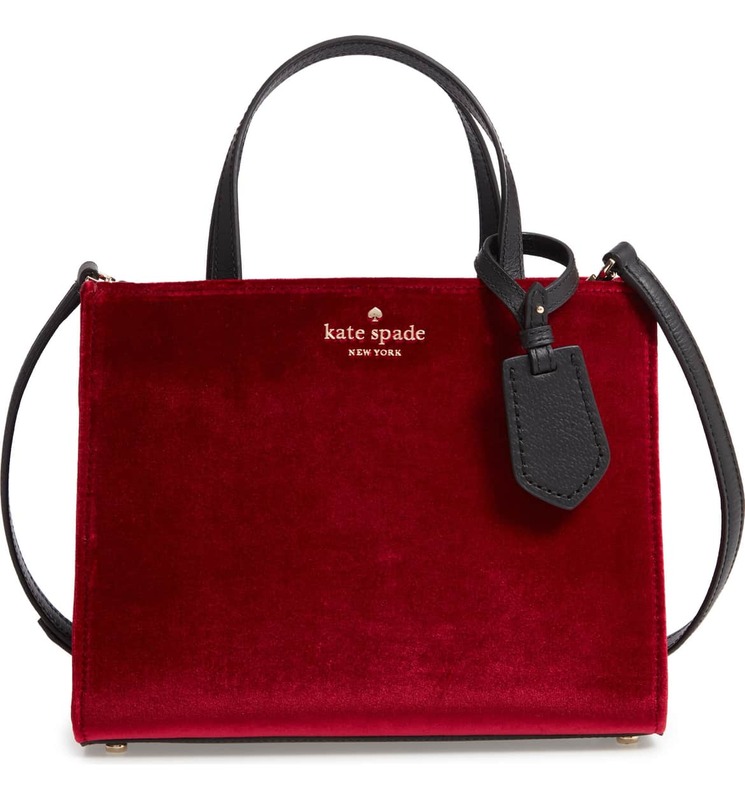 The Kate Spade New York Thompson Street Sam Velvet Satchel is a plush and luxe take on the classic top handle mini-tote. It boasts an open top, handles for easy carrying, an adjustable cross-body strap and dual interior compartments with a center zip divider. There are also zip, wall and smartphone pockets for storage. The design features protective metal feet for keeping the bag clean and scratch-free when we have to set it down. This bag is available in two colors: black and red (above). See it: Grab the Kate Spade New York Thompson Street Sam Velvet Satchel for $230. This Eliza J Velvet Sheath Dress is a super elegant, yet festive pick thanks to its vibrant velvet fabric, jewel neckline and quarter-length sleeves. This stylish frock is a great option for holiday parties at the office and works just as well for date nights. It comes in four colors, including green, purple (above), navy and rose pink. It is available in regular and petite sizes. Regular sizes range from 0 to 18. Petite sizes are available in 10P and 12P. Sizes are available based on color. See it: Scoop up the Eliza J Velvet Sheath Dress for $118. Whenever we want to pull off a fun look, but still need to keep warm and comfortable, we are pulling out these sultry Spanx Velvet Leggings for sure! They fit snugly and accentuate our shape thanks to a wide shaping waistband and a stretchy fabric blend that includes spandex. The leggings come in two colors: green and black. See it: Grab the Spanx Velvet Leggings for $98. 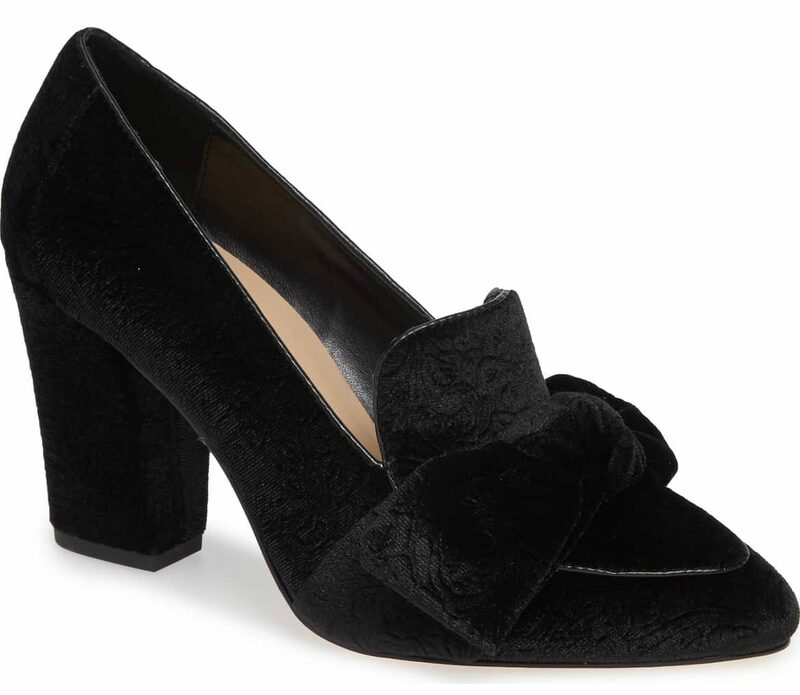 Pull off the sophisticated velvet trend with these lovely Bella Vita Gala II Bow Pumps that boast a comfortable low block heel and a dramatic bow at the toe. It is available in five color options, including blue, black (above), burgundy, champagne and gold. Shoe sizes range from 5 to 12. We also ADORE that these shoes come in various widths: narrow, medium, wide and extra wide! See it: Grab the Bella Vita Gala II Bow Pump for $90. One of the key rules to pulling off the velvet trend is to remember that we do not always have to wear the expected velvet colors like red, black and blue. Step out in this gold J.Crew Faux Wrap Velvet Top with black velvet leggings and mules for a look that is unique and still appropriate for parties. The top is available in three colors: red, gold and black. It also comes in regular and petite sizes. Regular ranges from 00 to 16, while petite runs from 0 to 12. 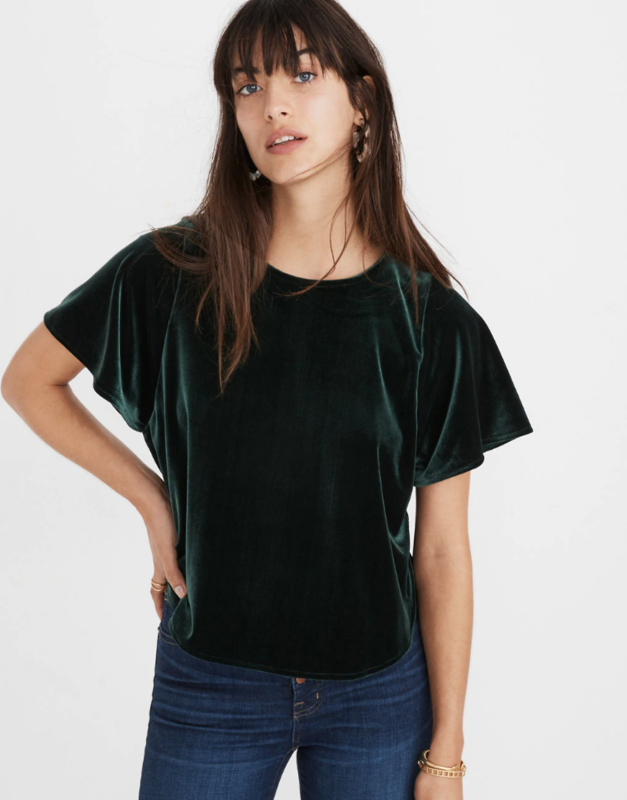 See it: Get the J.Crew Faux Wrap Velvet Top for $98 while so many sizes are in stock. Anytime we want to do velvet, but with a unique twist, this Eliza J Print Velvet Shift Dress is totally the go-to! 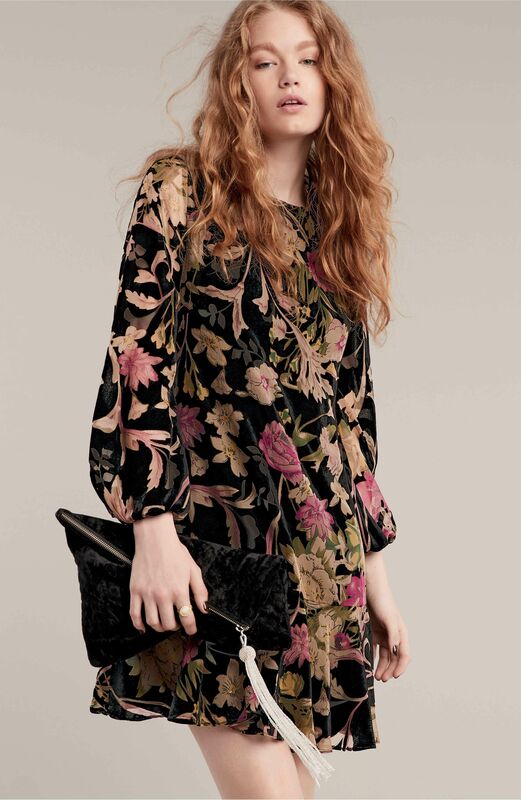 We love that the floral print is so appropriate for fall. The shift silhouette with dramatic bell sleeves gives this frock a vintage appeal. The dress is available in regular and petite sizes. Regular sizes range from 0 to 16, while petite sizes run from 0 to 14. See it: Grab the Eliza J Print Velvet Shift Dress for $178.